Really interesting creature (I believe that any flash creature has some merit). Most of the time it's an overpriced limited counterspell, but it can sometimes protect our own spells from fow or flusterstorm. When Queller leaves play the opponent can cast the spell, but maybe then it's too late for them. Spellstutter sprite has a similar effect, and thought it saw play some years ago, now it sees 0 play in vintage or legacy. However sprite effectively counters cc0 and cc1, while this card can ~~counter ~~exile cc2 and cc3. The cost is higher too. This it's only a 2/3, so it's not something terribly aggro, but every 2 damage counts (trinket mage has won too many matches). In a creature deck this can effectively be a time walk, while adding more damage next turn. It is exile and not counter, so it works well against uncounterable thought knot seers and Abrupt decays. 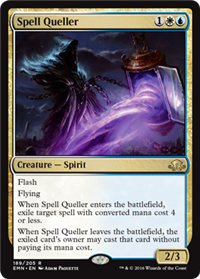 The fact that they get the spell if it gets removed is not negligible, but if you counter a counterspell with it, likely it will fizzle for lack of target. Also works with the eldrazi processor cards to remove the card from exile, but I am not sure there are any worthwhile processors to team this up with. Seems strong but also situational, and spirit is not really a relevant creature type yet. I think it spirit every gets tribal enough this may be very strong. @xouman Interesting that it uses the old (deprecated) templating so that you can bounce or sacrifice it in response to it's etb trigger for extra value. You could also target your tendrils, sac queller and cast the tendrils again for double storm. and I'm sure many many more. @Stormanimagus Spirits also have that 1UW Crystalline Sliver-type guy. Fit Tallowisp in there and you’ve convinced me. Bloodghast and Eidolon of the Great Revel see play. With the abundance of StPS and lightning bolt right now I think this is the wrong meta for this creature. You cast this against any white deck as a counter they just stp it and recast their spell. Against red, its a bolt to kill it. Though I do see its has flying. A 2/3 flying body in a u/w moat shell is nothing to sneeze at. Add potential utility, even if it is questionable quality due to the meta. I could see this guy seeing some play. But if he was released this time last year or even very early this year I think he have been stronger. This card is awesome and I love it. Mixing your counterspell slot with your win-con slots? Flash flying creature for control decks? Yes, please! Even better, it's got the old Oblivion Ring style triggers, so it works fantastically with Blinky the Eldrazi (Displacer) to exile uncounterable spells forever. Card is nuts! Not all cards that are nuts ever see play in Vintage. I have no idea where this fits in Vintage, currently. But it sure seems playable! I'm in for a bunch once the pre-sale hype deflates (this card is so-so in standard) and it's not longer retailing for 8 bux a pop. Can anyone say Spirit Tribal? @Stormanimagus Yes. Please do this. Spirit of the labyrinth, Mindshrieker (to combo) and Kira, Great Glass-Spinner to protect all creatures. For the side, kataki. I never sleeved that version, felt worse than just playing humans, so I traded spirit for canonist, mindshrieker for tasigur and kira for missteps. That's, like, 90% of a casual deck I have. Toss in some Control Magics, Tallowwisp, Curse of Chains, and so on. It's fun and trash. How is this Spirit Tribal creation better than the current white hatebears going around? EDIT: Tallowwisp appears to be bought out on a bunch of major retailer's websites. TCG Player hasn't been hit, yet. SPIRIT SPIKE? Don't forget Kataki, War's Maybe Playable. I've been testing Spirit Tribal and I must say it feels like a better Merfolk deck. Your guys have Flying, which might as well be Islandwalk. They can easily gain Hexproof (Drogskol Captain and Rattlechains), and have Spell Queller and Mausoleum Wanderer for counter magic beats, and Spirit of the Labyrinth for disruption. The board gives you a plethora of disruption Spirits for the matchups across the board. Does the lack of 2cc lords hurt the deck too much? If you comibne this card with Cavern you get an uncounterable counter-spell. The card seems playable to me. @Princess_Power build your own cancel now with added last word text.